Apple has a longstanding record of curating wonderful desktop pictures on both the Mac and iOS mobile platforms, so it’s not surprising that some users may wish to know where these default desktop wallpapers are stored in Mac OS. To be clear, we’re talking about the default desktop pictures that are bundled with macOS and Mac OS X and available to all users through the Desktop system preference, not the 43 hidden wallpapers we revealed in Mac OS X that are part of screen savers, and not any of the other imagery tucked away in Mac OS. You can browse through the desktop picture folder just like any other directory in the file system, just don’t delete anything in here because it would become unavailable to all users. Note there isn’t any reason to add wallpapers to this directory because desktop pictures can be changed from anywhere on the Mac, but it can be helpful to access these files directly for your own purposes, like resizing them to fit a specific display or device, cropping them to fit an iPhone screen, or even turning the picture to black and white or editing the colors a bit. If you want to make an adjustment, just copy a picture out of this directory elsewhere. 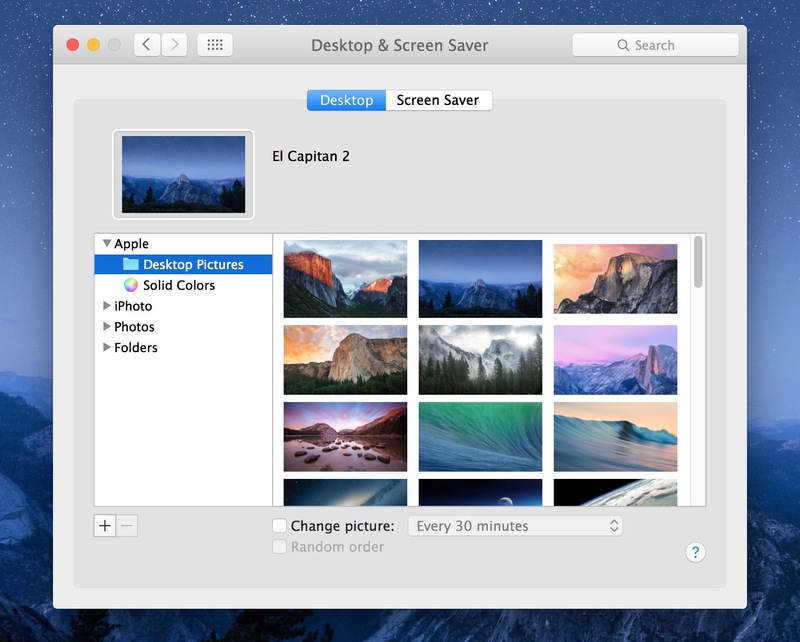 Another approach to reveal where not only the default desktop pictures are stored but any other that is actively set is to show the exact path of the currently set wallpaper through a defaults command, which overlays the path of the wallpaper on the desktop itself, which can be useful for quickly tracking down an image location but otherwise is not particularly sightly. And of course, if you set the wallpaper from Safari but have since been unable to track down the file or image, you can locate that file with this trick. 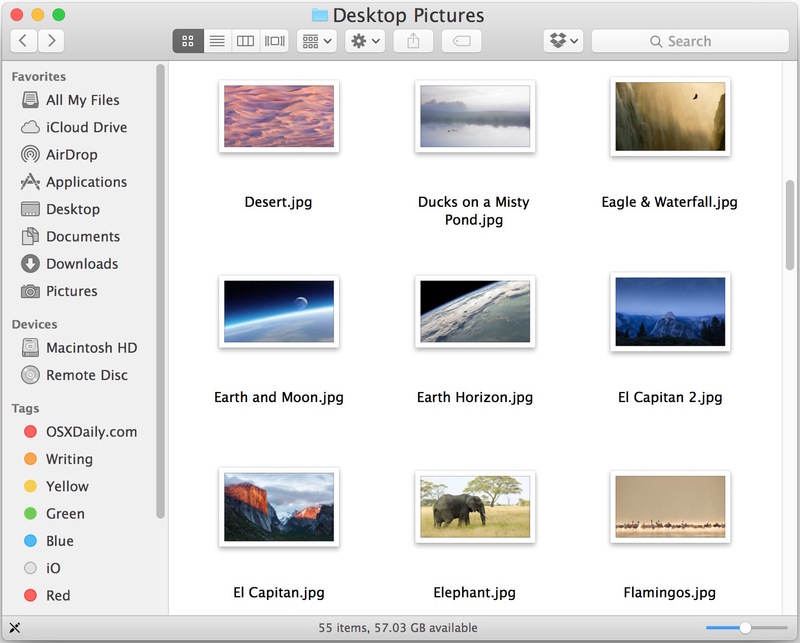 You have provided an interesting, if not essential, view into OS X, with your discussion of Desktop Pictures. On my part, I always remove Mac’s images – or at least set them aside so they are out of the rotation – and add my own. It’s yet another way of convincing myself I am still in charge. For those who want to return the login screen to one of those pictures in the folder described above–or your own–you can use Onyx/Deeper–free programs known to most people–to reset it. However, to do that, the picture has to be .png and has to be no more than about 11 MB. If it is bigger, Onyx or Deeper will allow you to change the login screen background . . . but it will not actually happen :( Per the developers, use a .png picture of that size or less. Modifying the folder mentioned to either add a picture or convert one from .jpeg to .png and resize it and all of that requires permissions which at least I did not have. To that most have to disable the csrutil through Terminal. To do THAT, reboot into Recovery Mode and check the csrutil status by typing that in Terminal. If enabled, which it should be, type csrutil disable. Now you can through Get Info grant yourself the permission for the folder and individual contents. Toss in your favorite picture, modify existing pictures, whatever. I would not re-enable it. Will just block your access next time you want to change something in the system. I tried it in Sierra, but it does not let me access Library/Desktop Pictures. Pressing Return or clicking on the button, gets be a “BEEP”. ~Library/ , then I typed Desktop Pictures. Pressing return or clicking on button did not give be the required open folder. However, when I deleted the ~ (tilde), it worked. FYI. I installed OS Mojave on two different computers today but the screensavers offered were different. Using your suggestion I was able to airdrop the jpg for the specific screensaver from one MBP to the other. Thanks for the link to Desktop Pictures.